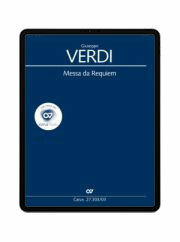 The first critical edition of Verdi's Requiem with complete performance material for sale. 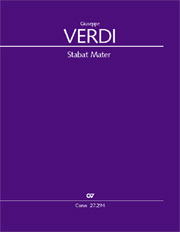 The edition is based on the autograph as the primary source and makes accessible one of the most important requiem settings of the 19th century in a modern scholarly edition. In particular, articulation, phrasing and dynamics are often indicated more precisely than in previous, well-known editions. By means of parallel passages, editorial additions attempt to make Verdi's intentions clearer through the judicious use of diacritical markings. A clearly organized disposition of the engraved music makes the full score and vocal score easy to read. Outstanding legibility of the parts. With an excellently playable vocal score by Paul Horn in tried and true quality. 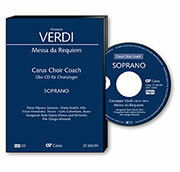 As a reasonably-priced alternative, a choral score is also available. With a foreword in three languages and a critical report. 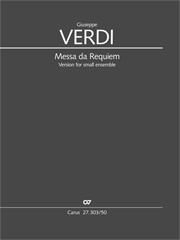 Among Verdi’s many compositions, as a work of sacred music, the Requiem remains unique. It was composed as a musical memorial for the Italian national poet Alessandro Manzoni, deeply admired by Verdi, and was first performed on the first anniversary of his death on 22 May 1874 in Milan Cathedral. The exploration of many extremes places Verdi’s tonal language wholly in the service of a dramatized liturgy. [...] this should become the standart edition. In bewährt-solider Weise legt Carus hier Partitur und Klavierauszug von Verdis großem Sakralwerk vor. Erfreulich ist, dass nicht nur die Partitur, sondern auch der Klavierauszug alle ausdrucksbezogenen Interpretationsanweisungen Verdis enthält, in italienischem Original wie in deutscher Übersetzung. Zusätze des Herausgebers bei Parallelstellen sind behutsam angebracht und kenntlich gemacht. Sowohl Partitur als auch der gut spielbare Klavierauszug sind übersichtlichgestaltet. Der Klavierauszug ist im Vergleich zu früheren Versionen wohltuend lesbar/spielbar gestaltet. 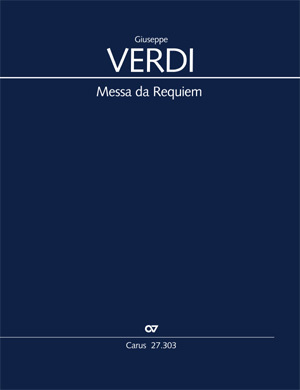 This new edition by Carus-Verlag, edited by Norbert Bolin, is based on the original manuscript as the primary source and makes accessible one of the most important requiem settings of the 19th century in a modern scholarly edition. In particular, articulation, phrasing and dynamics are indicated with consistent precision. 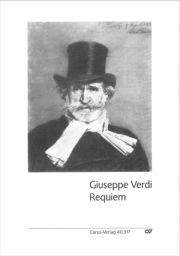 Editorial additions, by means of parallel passages, attempt to make Verdi’s intention clearer through the judicious use of diacritical markings. And a clearly organized disposition of the printed music makes the full score and vocal score easy to read. The publication is made complete by a less expensive alternative in a clear, playable vocal score by Paul Horn, arranged to maintain the same quality as the full orchestra score.